It had to happen sooner or later. The stars align, the traffic patterns converge, and I find myself food trucking on a stunning spring day with my BFF Amanda and my college roommate Ford McKenzie. It’s almost as good as the first time the Super Friends teamed up – but less spandex. Here’s what transpired. It started like any other ordinary, ho-hum day. I am leaving an appointment at the dermatologist (I ask you, what could be more ordinary than that?) and I’m obsessively checking Facebook on my iPhone as I ride the elevator down to street level. There I see the post that will forever change my day. 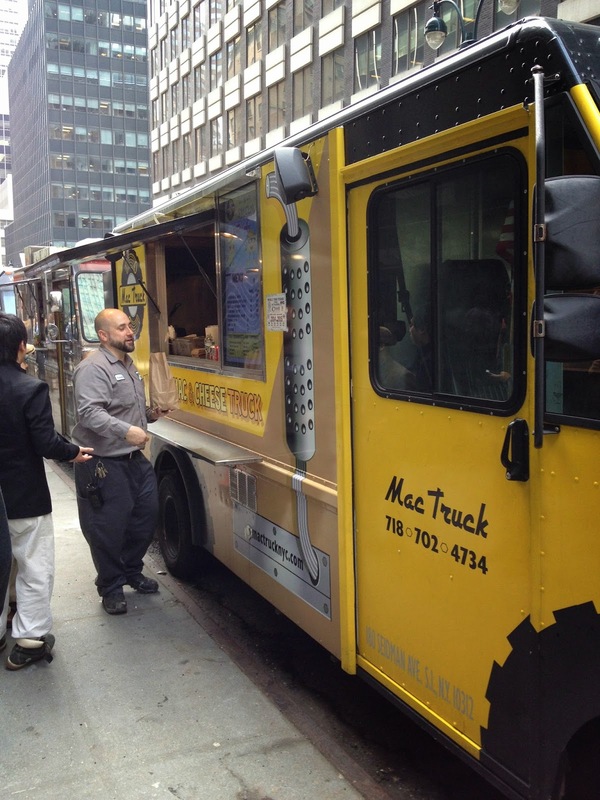 The Mac Truck has landed on 47th below Park. 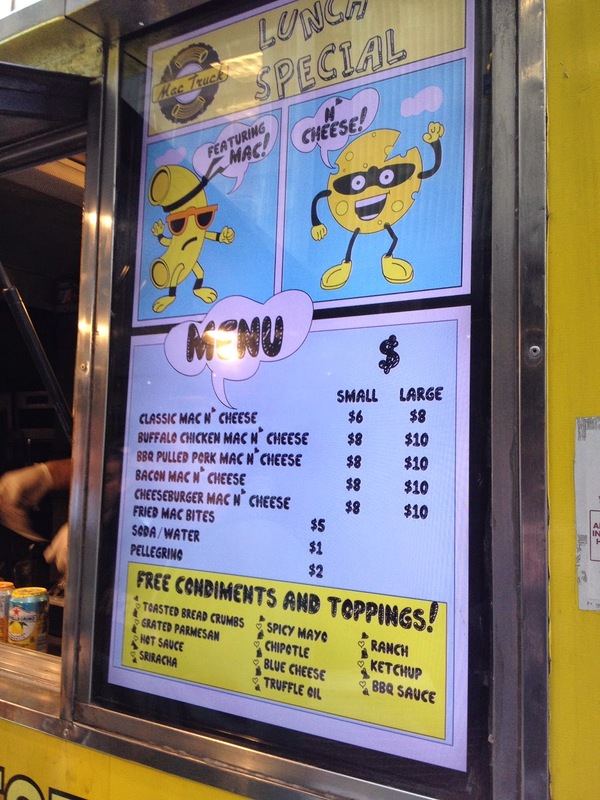 The Mac Truck is the primary purveyor of mac and cheese truck food in New York City. I’ve been tracking the Mac Truck for close to a year, but never, ever have I found myself in the right place at the right time. This is simply unacceptable for a mac and cheese addict. Standing on Broadway, I immediately ping my BFF Amanda back at the office. Is she free for lunch? Her response makes me weep. She is in back-to-back meetings until 2:30 pm. Next I ping my college roommate Ford McKenzie. Despite having spent way too much quality time with me in recent days, he is game for lunch and agrees to rendezvous on Park Avenue at 12:15 PM. Success! I can almost taste the cheddar! What happens next can only be described as carbohydrate karma, or an embarrassment of high calorie riches. Amanda’s noon appointment cancels, and she too, is available for lunch! “OMG, power of intention!” she responds. Double good mac and cheese and a double date for lunch! “I’m suited up and I’m even wearing lipstick today,” she writes. “You will look stunning in whatever hotel Ford chooses for lunch,” I write back. We convene in the lobby at noon. Amanda is wearing a fabulous charcoal suit by Chicos, turquois jewelry accessories by Stella & Dot and cosmetics by Bobbi Brown. And don’t forget the heels. The hike to 47th and Park is a little daunting, particularly for a gal in heels, but Amanda soldiers on with great pluckiness. I have a moment of panic when we get to 47th and I don’t see the Mac Truck. Have I dragged this poor woman across town in heels for nothing? We spot Ford on the corner. 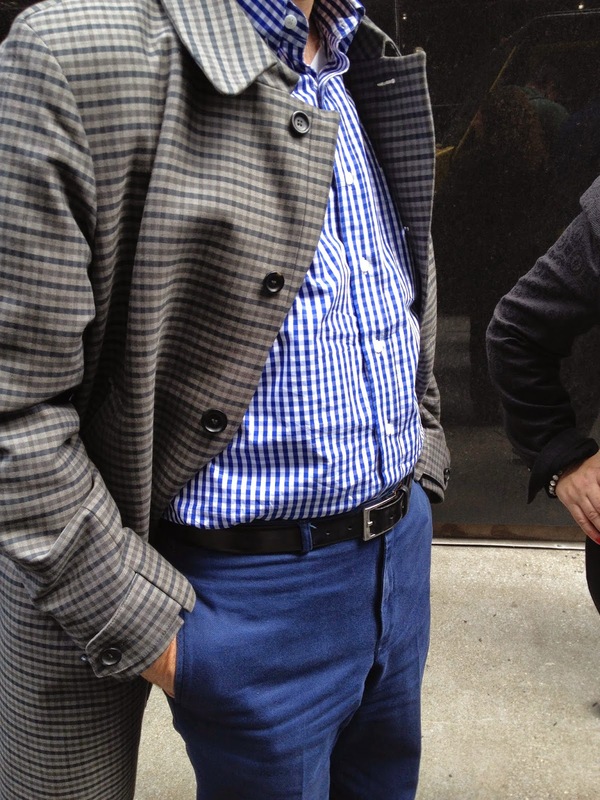 He is decked out in Carhart for Opening Ceremony cotton pants, checked custom shirt from Maxwell’s of Hong Kong, Timberland for Opening Ceremony boat shoes, a contrasting check car coat by Hope, and Brooks Brothers underwear and socks. (I didn’t fact check the last reference). I am wearing generic jeans, and a Charles Tyrwhitt slim cut sky blue gingham shirt, but this is never about my fashion choices. I introduce them, realizing that Superman and Batman have nothing on this team. This team up is perhaps more momentous than when Holmes met Watson, or Mary met Rhoda. “I’m wearing skinny clothes,” says Ford by way of introduction. “They’re not really conducive to eating mac and cheese.” One must pity the poor fashion-forward gentleman who buys his slacks one size too small. I sense a commotion on the other side of Park, and indeed there seems to be a street party in progress. There, sandwiched between a line of food vehicles is the elusive canary yellow Mac Truck. We join the communal lunch line. A medley of R&B and gospel music is blasting from the speaker on the Mac Truck. Overall, this food choice may be a little risky. It’s very near the end of mac and cheese season. 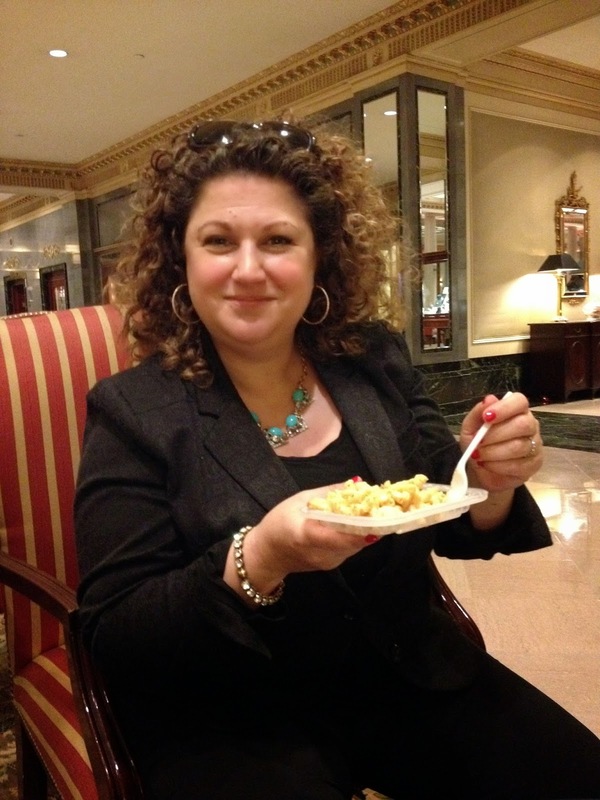 Gorging on mac and cheese in late spring is a little like wearing white after Labor Day. Ford immediately reveals all my deep, dark secrets from college. “We used to call him the Phantom,” he tells Amanda, “because we could never find him.” Amanda appears to file that fact for future reference and leverage. 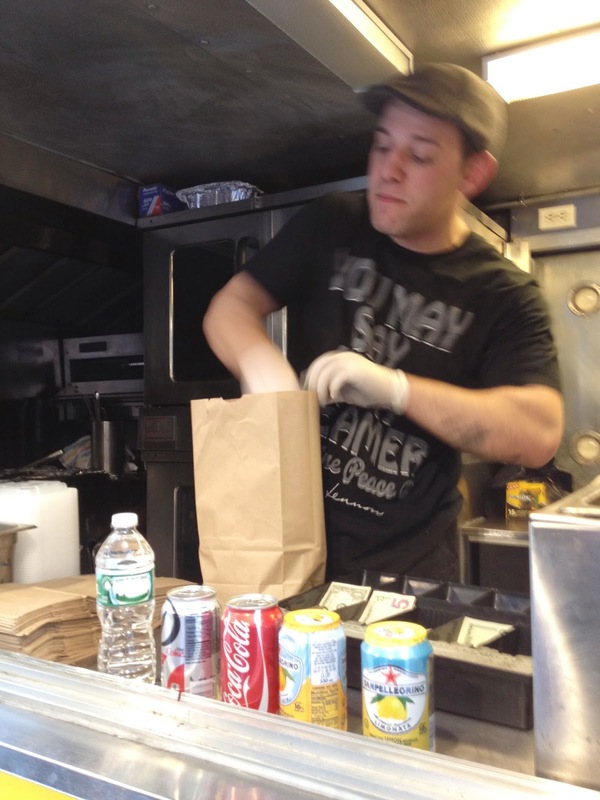 We reach the truck window where we are greeted by Dom, a lively and wiry guy, who is scooping mac and cheese into plastic containers. He wears a black T-shirt with the slogan, “You May Say I’m A Dreamer.” Until then, I’d not realized that John Lennon was a mac and cheese fan. The “small” serving of mac and cheese could feed a small army. We can't even fathom ordering the large serving. Ford makes a snide remark about the calorie content, which Dom summarily dismisses. “I’m on the mac and cheese diet and I’m losing weight,” he retorts. Amanda orders the Classic Mac N’ Cheese with breadcrumbs, I choose the Bacon Mac N’ Cheese with Parmesan, and Ford orders the BBQ Pulled Pork Mac N’ Cheese and a side of Fried Mac Bites. That’s right – basically Mac N’ Cheese croquettes. As he is a connoisseur, Ford also orders an orange soda to go with his nearly orange lunch. The question we now consider is where do we eat? Ford suggests the Intercontinental Hotel, which is right around the corner. We’ve dined there before, but he likes the cushy paisley sofas in the lobby and thinks they will be perfect for the inevitable food coma that will follow lunch. As we approach, the door to the hotel opens automatically, as if to welcome well-dressed street food urchins with open arms. We settle down on the paisley sofa, lay out the carbolicious buffet and begin to sample. Immediately, the toasted breadcrumbs scatter across the mahogany veneer tabletop. Amanda notes that the Classic is just a touch bland, and we wonder if Dom was dancing so fast that he might have left out the salt. 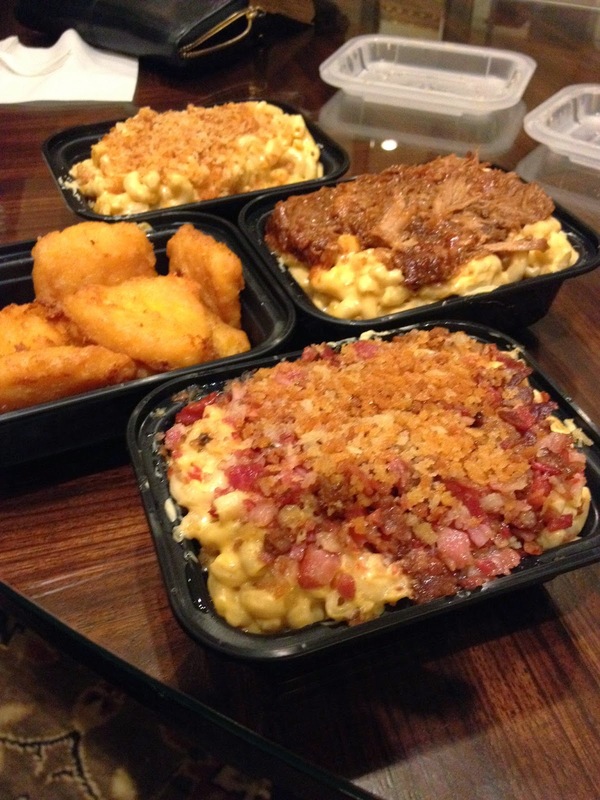 The Bacon Mac N’ Cheese is loaded with smoky flavor, and the fried Mac Bites are just a ridiculously excessive indulgence. 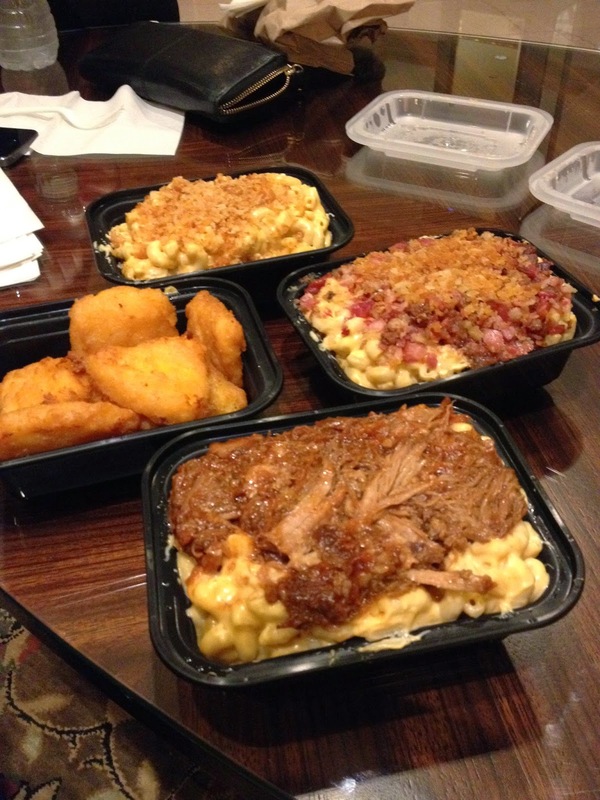 Hands down, our favorite is the BBQ Pulled Pork Mac N’ Cheese, which has a perfect balance of sweet and smoky BBQ sauce and cheesy goodness. I guess we are mac and cheese iconoclasts at heart. Amanda gives Ford career advice (because that's what she does, and quite well, thank you) and the two of them trade parenting tips and tribulations, while I nosh on the noodles. And, if there is any doubt by now that dining on street food in hotel lobbies is the next big thing, I note that there is a couple reclining on the sofa not far from us, chowing down on taco salad in Styrofoam clamshells and drinking Pepsi. We truly are trendsetters. The food coma is almost immediate. Ford considers checking into the hotel for the afternoon or making a coffee run. After all that cheese sauce, Amanda wants a palate cleanser, so we agree to stop at a frozen yogurt truck on the way back to the office. “Sprinkles are essential,” Amanda notes as we begin to clean up our indoor picnic. “My figure can’t handle frozen yogurt after mac and cheese,” says Ford and he leaves us after we’ve deposited our trash in a can on 48th Street. 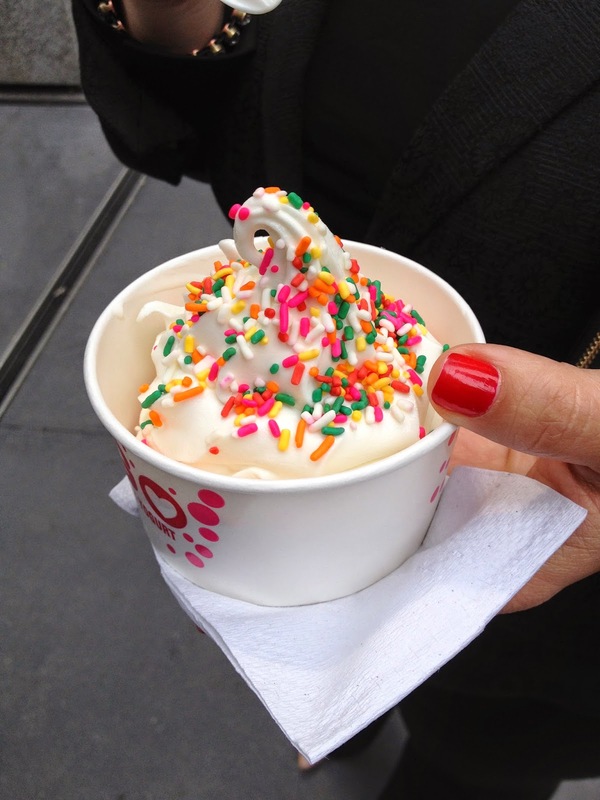 I treat Amanda to an awesome swirl of vanilla yogurt with rainbow sprinkles, and I can’t help but notice how beautifully her perfectly lacquered red nail sets off the multi-colored sprinkles. Can you imagine that some people actually bother to go to the Four Seasons for lunch? If only they knew what we know. 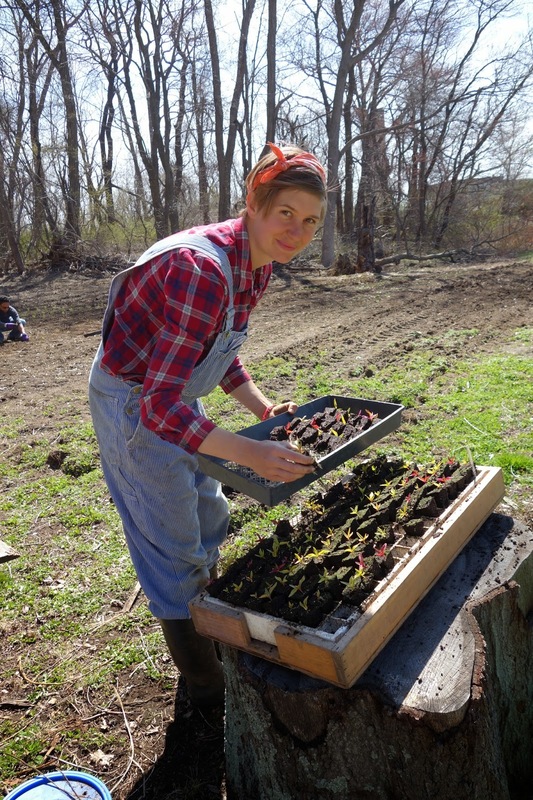 The joys of Easter are upon us, and after a particularly hard winter, the community at Restoration Farm seems to embrace the tasks of spring with renewed vigor. 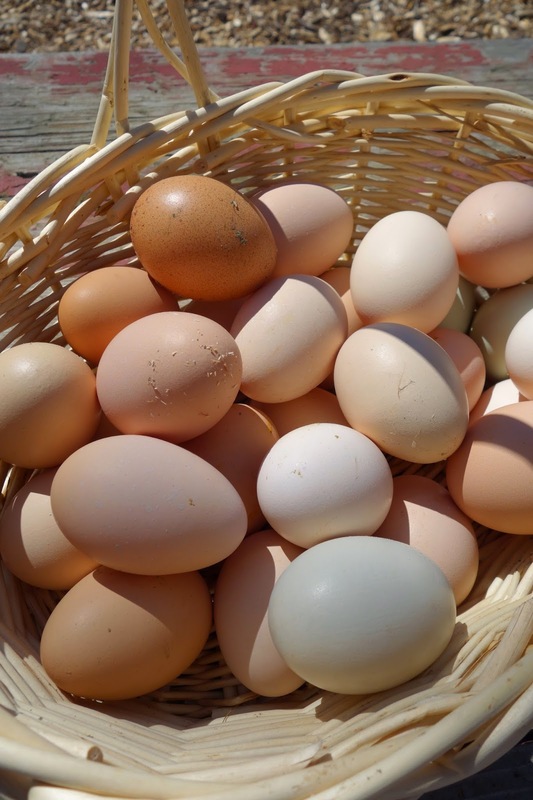 Donna’s hens have been busy producing baskets full of pastel eggs perfect for the holiday. 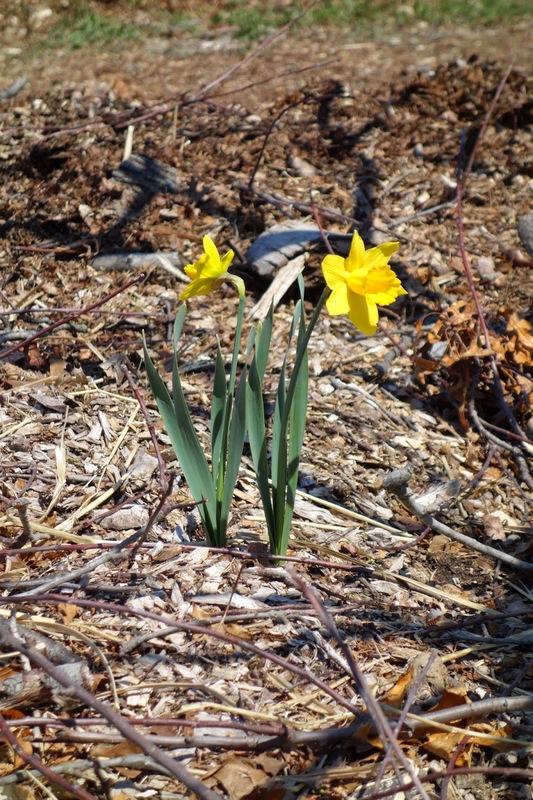 Signs of activity and new life are abundant. 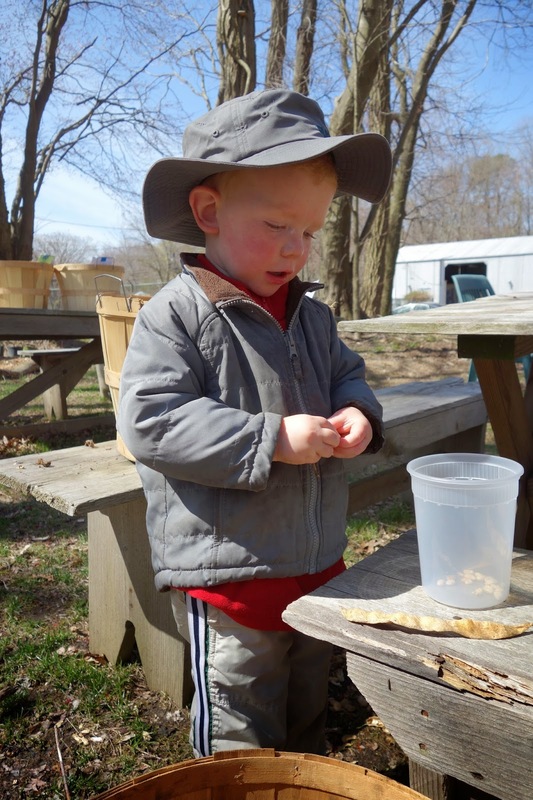 Caroline, George and Kobi are shelling last year’s pole bean pods, and extracting the seeds in anticipation of this season’s planting. Ever the engineer, George is devising new ways to get the shelling done more quickly. 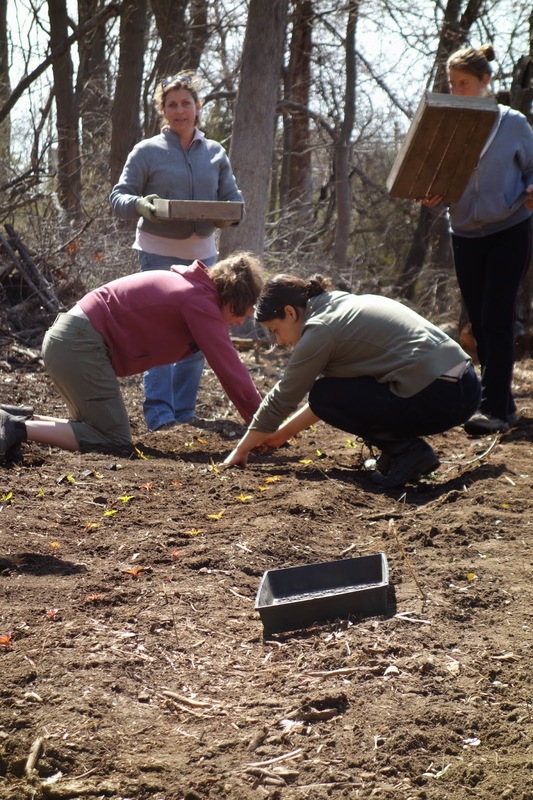 Zsofi, Natalia and a group of volunteers are preparing the flowerbeds for a summer of brilliant color. 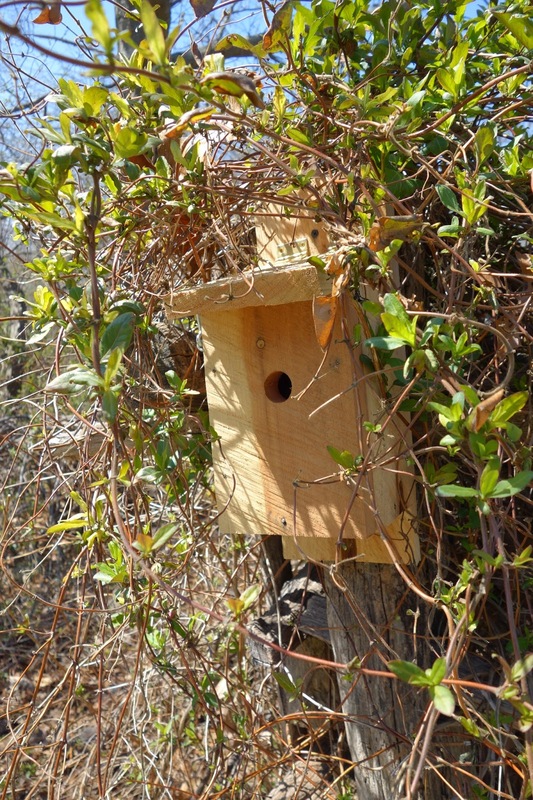 Hal has constructed a top bar beehive to attract those stalwarts of pollination. The bees will enter through the bottom, and build honeycombs draped from each narrow bar that lies across the top. 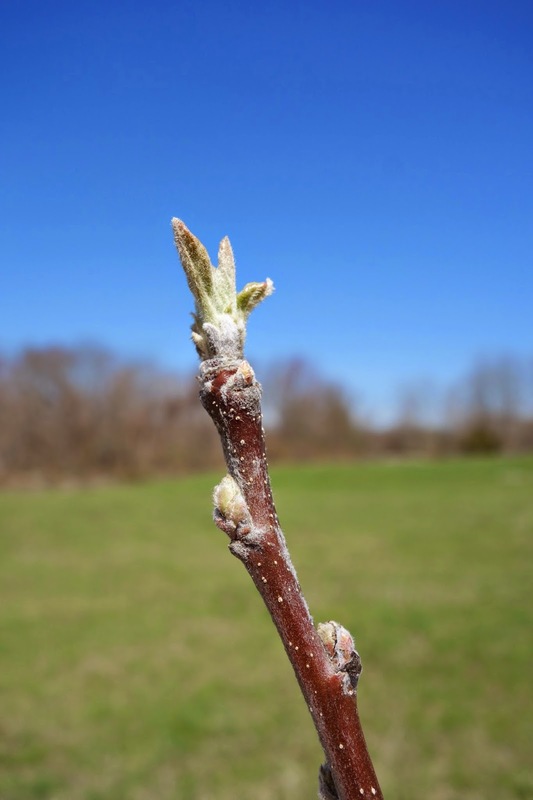 At Apple Trace, buds on the two-year old heritage apple trees are beginning to open. 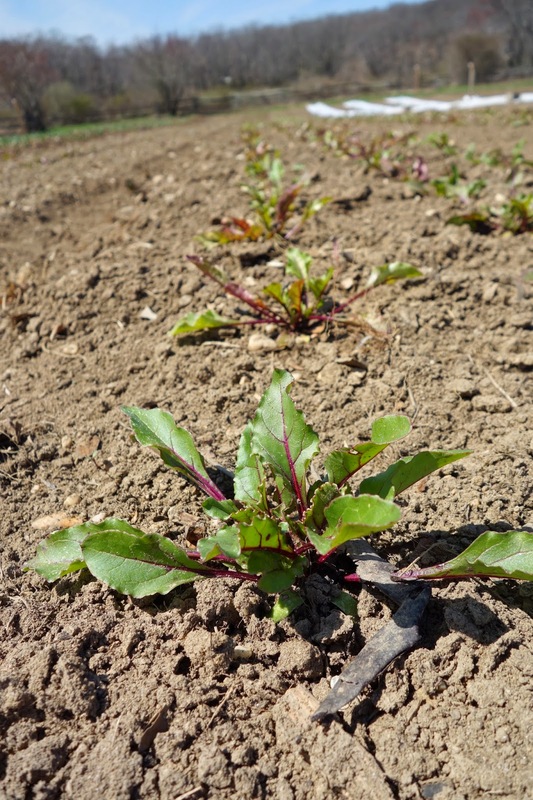 In the field, tender leaves of kale reach towards the sun. We will soon be worth our weight in greens. Freedom Ranger meat birds have settled into their daily routine of foraging in the fields. 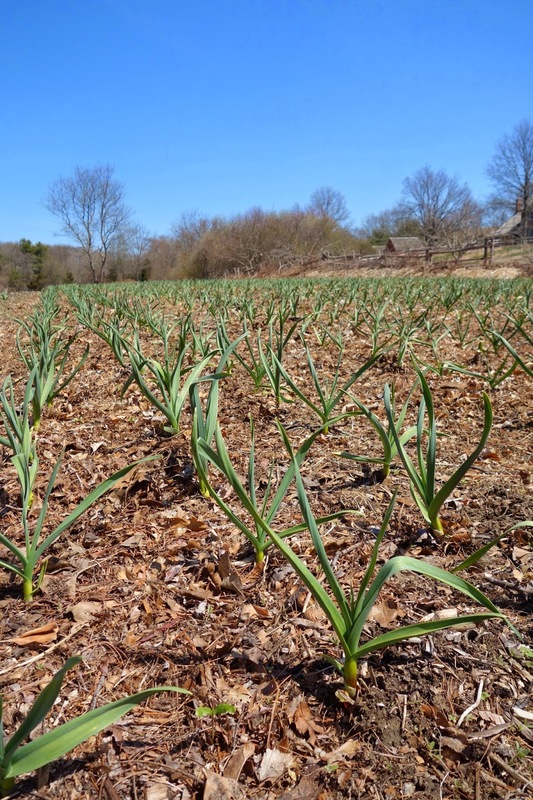 The Garlic Field is covered with bright green shoots that will soon give way to the first garlic scapes of summer. 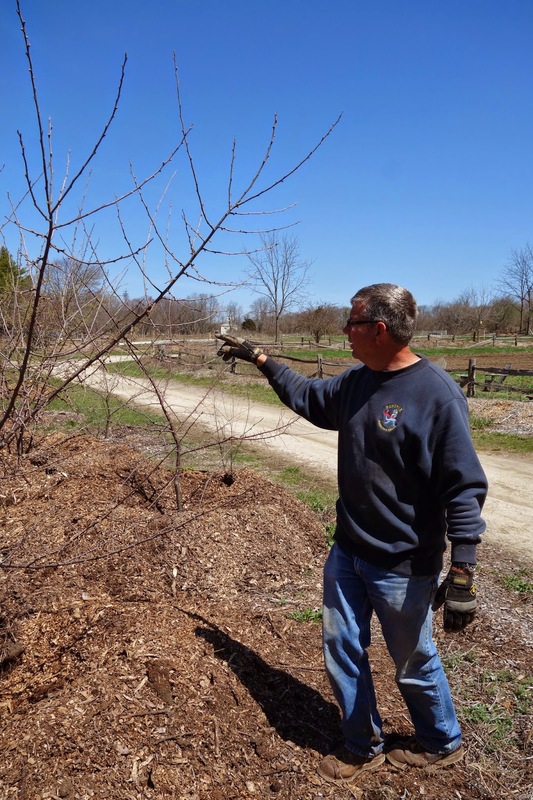 At the Hewlett Apple Orchard, Glenn had pruned and mulched the sweeping hill and planted additional rootstock. And, scattered throughout the farm and the historic village are new abodes each anticipating their first flurry of tenants. They call it agri-“culture” for a reason. 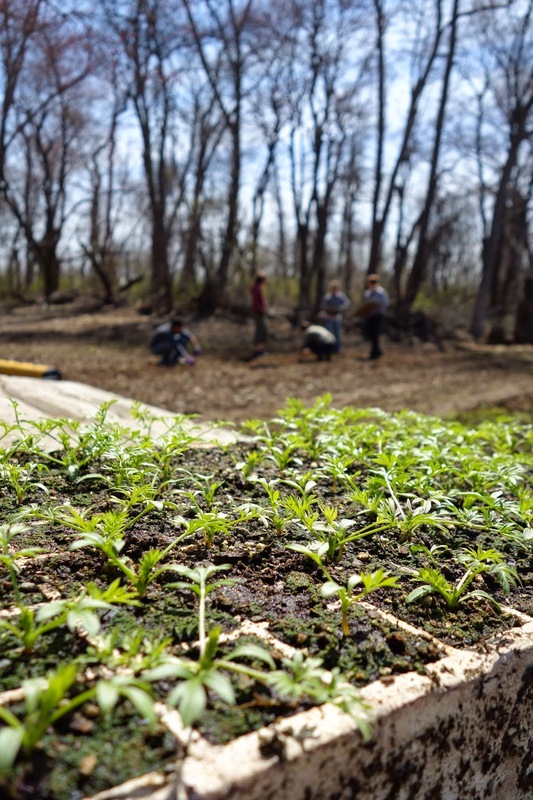 The modern neighborhood farm nourishes not only the body, but also the soul, and works to cultivate a sense of culture and community among its members. Music draws people together, and has always been present at Restoration Farm. Strains of jazz, folk, and rhythm and blues – offered by local ensembles – always accent the family-style potluck dinners held in the field. But now, we’ll be harvesting music even more frequently. Tin House Music at Restoration Farm will offer live concerts at the farm all summer long. The venue is the multi-purpose tin storage shed erected by Nassau County this past winter at the entrance to the farm at 140 Bethpage-Sweet Hollow Road in Old Bethpage. Sunday concerts start at 2:00 PM with an open mike hour, followed by the scheduled performance. 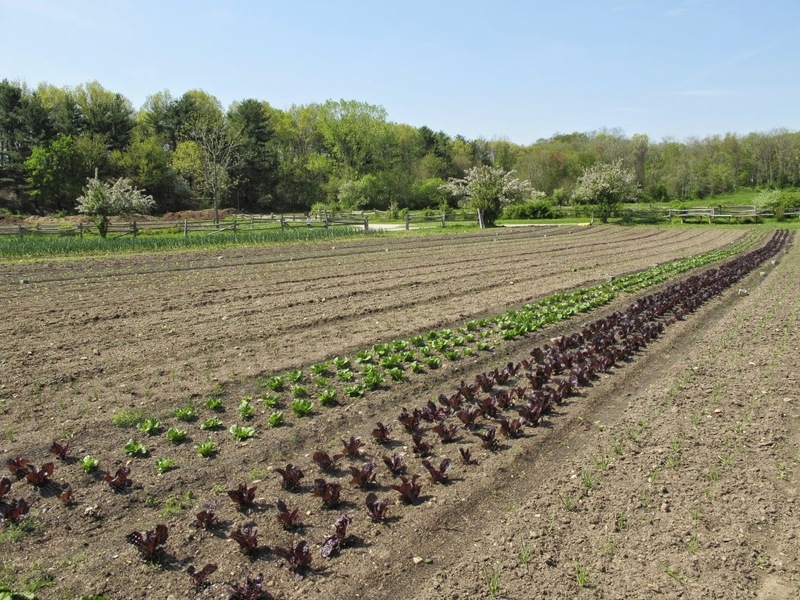 It’s long been a goal of head growers Caroline Fanning and Dan Holmes to launch an arts and education program that enhances the multi-sensory experience at Restoration Farm. As one who is rarely without music playing, I’m excited about the addition of the Tin House Music series to the rhythm of the farm. 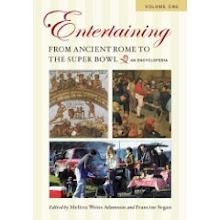 Tickets are $15 each and can be purchased at brownpapertickets.com or email susan@restorationfarm.com to reserve. The co-owners of Roots Bistro Gourmand in West Islip, Long Island have deep respect for the roots of cooking, but aim to transform the traditional bistro experience using techniques of New Age gastronomy. Read my profile of Corbet and Orlandi here in Edible Long Island’s Spring 2014 Innovation Issue.